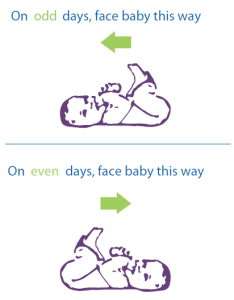 Since then, there has been a large decrease in Sudden Infant Death Syndrome, or SIDS; but because babies are no longer spending enough time on their tummies, there has also been an increase in flat head syndrome (plagiocephaly), and positional torticollis, which is when a baby’s neck becomes stiff or tight, causing their head to tilt to one side. 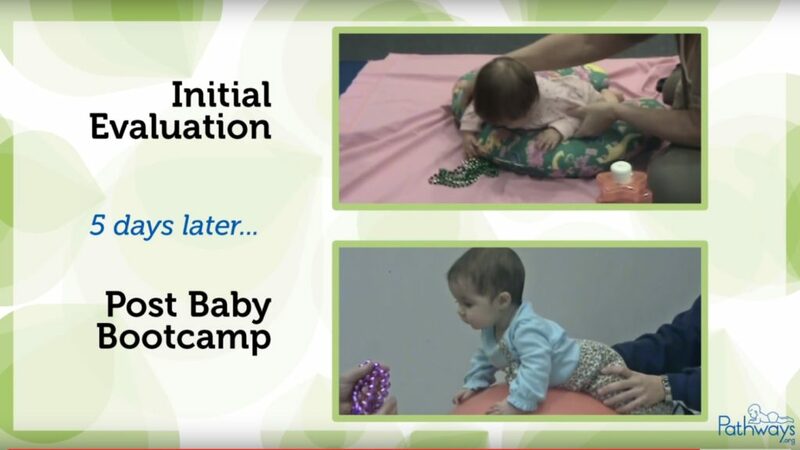 So babies need this time on their bellies while they are awake to develop neck and core strength. Enter Tummy Time! Many babies don’t like Tummy Time at first, but hey, it’s hard work! Using toys, blankets, and even your lap when you first start out will make it more comfortable and fun for baby to build up their muscle strength. As your baby gets stronger, you want to try and increase the amount of time baby is actually doing Tummy Time. Eventually, you want baby to do an hour of Tummy Time on the floor every day, with baby pushing up on her arms and picking her head up on her own. An hour may seem like a lot at first, but you can add Tummy Time into baby’s daily routine, like a few minutes after every diaper change. You’ll reach an hour sooner than you think! Tummy Time can really help your baby’s development, so commit to making it a part of your daily routine. Tummy Time is what helped 6 month old Charlotte reach milestones she had missed. Her mom, Tara, noticed a difference when comparing Charlotte’s development to the typical milestones baby should be reaching at 6 months old on the Pathways.org website. She wasn’t lifting her head up or rolling over. Tara found help from a Pathways.org physical therapist and developed a plan to get Charlotte back on track and reaching her gross motor milestones. Over the course of five days, Tara got her entire family involved in Tummy Time and they were able to motivate Charlotte to lift her head up. Hear Tara’s full story and watch Charlotte’s progress here. 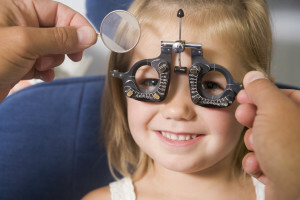 There are different types of eye doctors and picking the right one can be tough. Find out to see what types of eye conditions they treat. Make sure baby is sleeping safely. Use our ABC’s of safe sleep to help you easily remember.